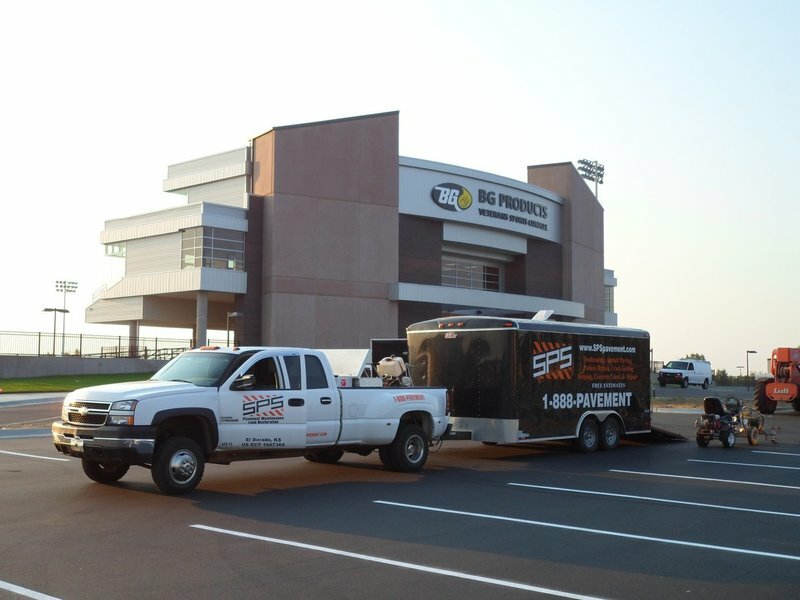 Surface Protection Services, LLC, or SPS, is a full-service pavement maintenance and construction company. We are classified as a small business, and our main operations are headquartered in El Dorado, KS. We offer a wide range of services throughout Kansas, Oklahoma, and Nebraska, with an emphasis on the Wichita, KS and surrounding area and also the Manhattan/Topeka area. We want to help you protect your investment. By using our extensive knowledge of the industry, we can assist our customers with implementing a detailed preventative maintenance plan that not only significantly increases the longevity of their parking lot, street, or driveway; but also saves them money in the long run. We would love the opportunity to earn your business and be your long-term partner, not your one-time contractor. We offer the highest quality service possible - Every time. Every day. No exceptions. 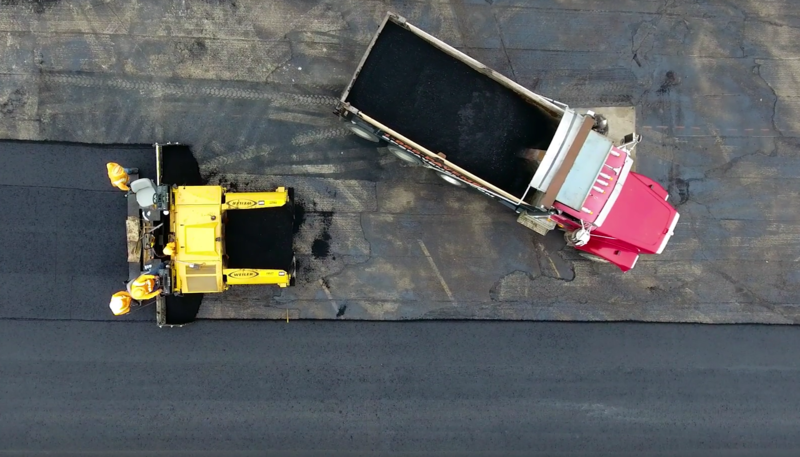 The asphalt services we offer are milling, paving, sealcoating, crack sealing, thermal crack repair, and pothole repair/patching. 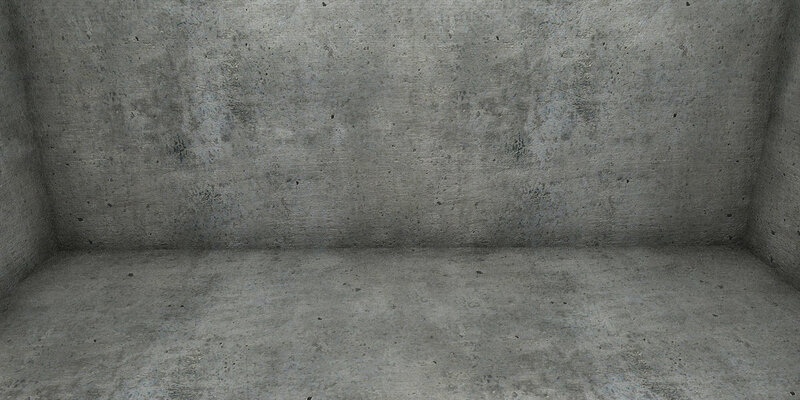 Our concrete services include new construction and repair of parking lots, sidewalks, approaches, drainage flumes, curbing, patios, driveways, ADA ramps, golf cart paths, steps, decorative stamped concrete, as well as joint sealing. 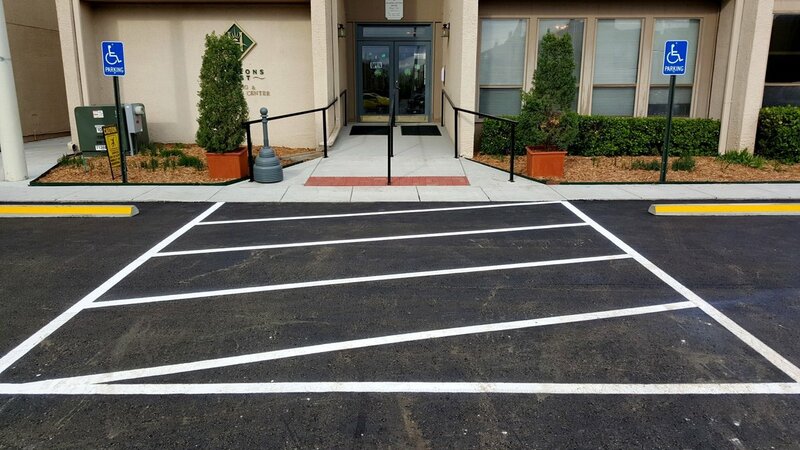 We also offer striping/line painting as well as the replacement/installation of parking area signage, bollards, parking blocks, and speed bumps. We can also take care of your gravel and aggregate needs with our fleet of dump trucks, and we have our own premium crushed/screened asphalt millings for sale in our yard. Our diverse array of customers ranges from large commercial parking lots to residential driveways to city streets. "We make a conscious effort to base our company standards and practices on “quality” and “value”, and not necessarily “cheapest”…although we do keep our prices very competitive." SPS filed as an LLC in April 2005, and has been family-owned since the beginning. The owners, Andy Waller and Russell Waller, began operating the growing business as the only employees with nothing but a couple shovels, a truck, some rented equipment, some business know-how, and a great deal of knowledge of the pavement industry. Today, SPS runs 9-10 full time crews, and employs over 60 hard-working people that take great pride in their workmanship. Over the years, the owners have paid themselves a minimal salary, reinvesting every possible dollar back into the company. Russell was a foreman/superintendent for Dustrol, Inc. for several years, leading a road crew and working with management to help grow a very successful asphalt recycle/milling company. When he hired on with Dustrol, they had 11 employees and 1-2 crews. They now have over 300 employees, have operations in several states and are the largest milling contractor in the U.S. PMSI, a pavement maintenance supply company, hired Russell to demonstrate to potential customers the proper uses and techniques of various pavement maintenance equipment. His experience in the industry has been a key attribute, helping develop SPS into a strong, growing business. His current role in the company is quality control, safety, material ordering, and fleet management. Andy is the son of Russell. He went through high school and college with a dream of someday owning his own successful business. He graduated with a 2-year degree from Butler Community College, paid for by several academic scholarships, and then transferred to Wichita State University. There, he studied entrepreneurship, business, and economics, and took several mechanical and architectural engineering and AutoCAD classes to increase his knowledge in these areas as well. He bought a 3-bedroom house when he was 19 years old and rented out two of the rooms; paying for nearly all his living expenses to get him by while finishing school. By spring of 2005, Andy had finished college and was ready to put his knowledge to use. His current role in the company is job estimating, scheduling, PR, HR, and operational management. 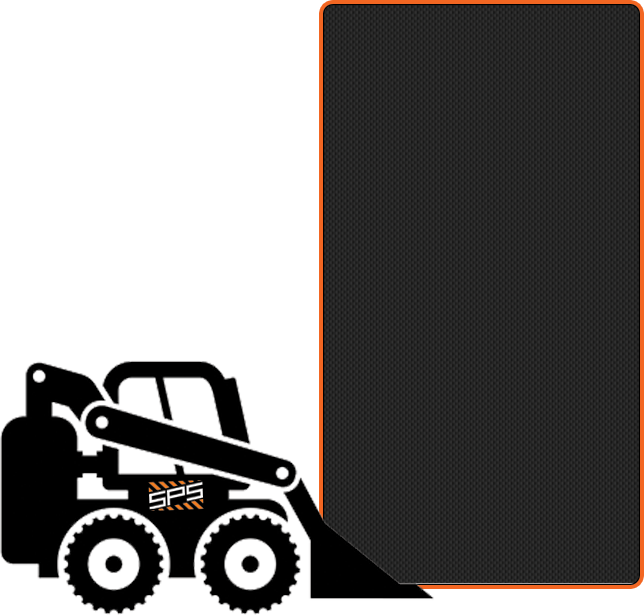 Josh Clevenger came to SPS in August of 2013, having been in the commercial pavement and concrete business since 2005. He is a graduate of Wichita State University and has lived in Kansas his entire life. Having established many relationships prior to SPS, his addition has been a great asset to the company. His primary role is Estimating and Project Managing but serves in other capacities as well. 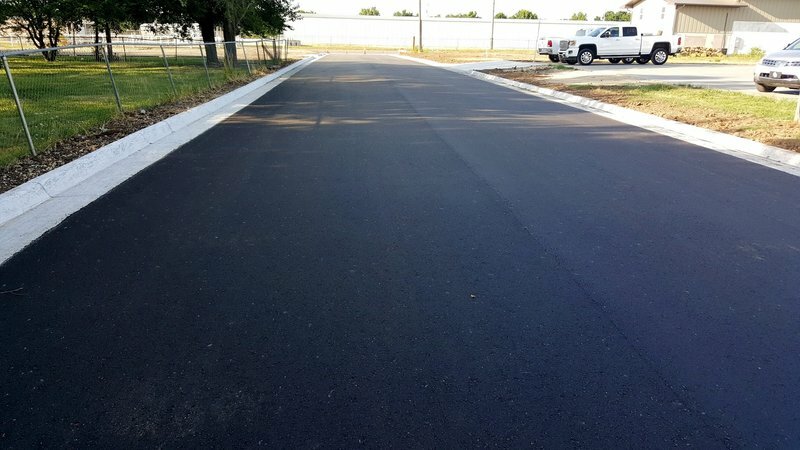 Primarily, he handles big box store projects in Kansas and Oklahoma and new retail/restaurant civil construction but he also has several property managers that he provides asphalt and concrete services to. He is married to Trisha, and has 2 girls, Kyndall and Camryn, and 2 boys, Gage and Blaze. He enjoys attending his kids sporting events, coaching youth sports, attending WSU Shocker Basketball games and ranching. "We do things right. We don’t send a bill until our customer is 100% satisfied. Period." So many companies spend thousands of dollars on radio ads, billboards, flyers, etc. because they rely on first-time customers only and they never get repeat business. Not SPS. We want long-term working relationships, not a lucrative 1-time contract. That’s not who we are. We believe in fair pricing from the beginning, we believe in earning trust, and we believe in leaving our customers so impressed that they tell others about their positive experience. Trust is not given, it is earned. The owners did not grow up with money…they earned everything they had and worked hard for it. We want to earn it because that’s what will make you want to hire us again and again and again, and that’s all we know. When a competitor loses a customer by not performing, that customer may try SPS next time. Immediately they notice the difference. We earn that customer’s trust by going above and beyond what they expect from a typical contractor, and our client list goes up while our competitor’s list goes down. That’s our business model in a nutshell, that’s why our customer retention rate is so high, and that’s why we grow. We have worked tremendously hard to build and maintain a standard of excellence. Our customers know this. We consistently grow each year by a minimum 25-30%, with absolutely ZERO marketing except the website you are visiting. How do we do that? It’s a simple explanation, but an incredibly difficult task to accomplish that requires discipline, hard work, and an unwavering determination and commitment to do things the right way, the first time, every time. It’s in our blood at SPS. It filters straight down from the owners to the guy running the shovel or driving the dump truck. We do things right. We don’t send a bill until our customer is 100% satisfied. Period. So, back to the question of HOW…..Our customers hire us back again and again and again. We retain our customers, and we EARN their referral. We work for that referral again and again and again. The original referral gives us referrals. And the process continues. We speak with our actions, not with our words. We take pride in our work. We perform. We have higher expectations for ourselves than our customers have for us. This is why we grow so fast while spending $0 on marketing. it comes to completing a job,..."
Our lower cost of operation gives us an excellent competitive advantage. We do not cut corners when it comes to completing a job, so for those customers who only look at the dollar amount rather than the value, we have a tough time winning a bid against a company that does cut corners. One way we have stayed competitive in this situation is controlling our debt level and keeping a very close eye on our overhead expenses. This allows us to be competitive in our pricing while producing a higher-quality job. When we are competing against much larger companies, we can usually outbid them due to our lower residual costs. We are constantly trying to stay up-to-date on the latest technology and methods, only buying new or slightly used equipment. Our use of newer equipment and our detailed maintenance schedule greatly reduces down-time caused by equipment break-downs, and speeds up production. The majority of our work comes from property management companies, school districts, colleges, churches, commercial businesses, big-box stores, and small to mid-size towns and cities.  Before a customer hires us for that first job, they can see right away what separates SPS from other contractors in the industry. 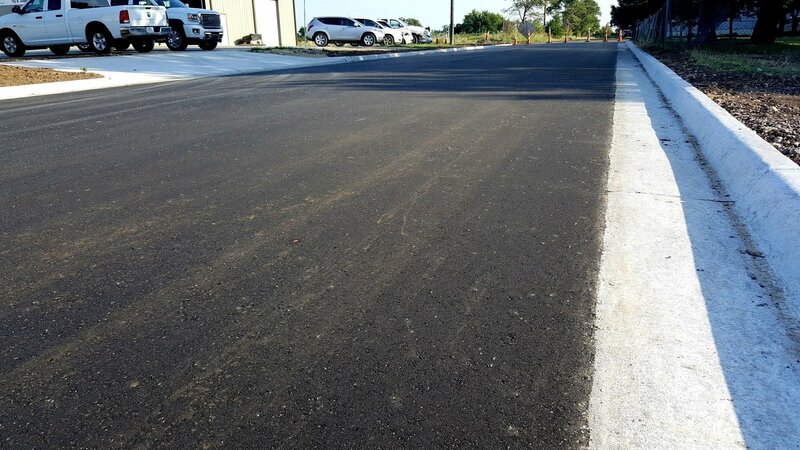 First, they are offered a free typed assessment of their parking lot(s) or streets explaining all the issues and concerns of their pavement, complete with recommendations, a priority list, a price for the repairs, and suggested future routine maintenance to increase the longevity of their asphalt or concrete. While working at the job, our employees are trained to be courteous to all customers, tenants, and pedestrians, to work with the customer if any issues, concerns, or traffic flow problems arise, and to take pride in everything they accomplish during the day. We guarantee that all work will be completed in a timely, professional manner, leaving the jobsite cleaner than when we began the project. After the job is complete, either one of the owners or the foreman will do a complete walk-through with the customer to make sure they are pleased with the completed job. Another big strength is our near-perfect safety record. With our nearly flawless safety history, we are one of the industry leaders in our region. Since we filed as an LLC in 2005, we have had only 2 very minor lost-time accidents. We attribute this to extensive employee training prior to them being placed in a safety-sensitive position, our careful hiring, and our very strict drug & alcohol policy. Safety is a number one priority at SPS, and our records prove that. All of our equipment is state-of-the-art. 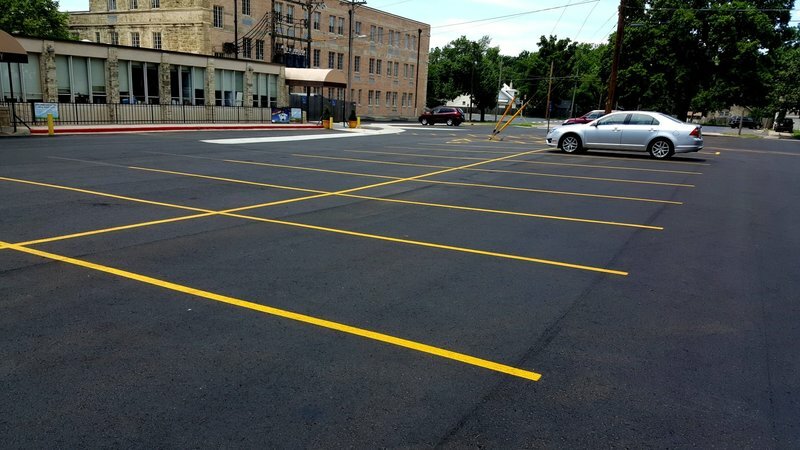 We are set up for tackling the largest sealcoating jobs in a very timely manner, while having the ability to precisely measure and apply the appropriate amounts of sealer, additives, sand and water to meet or exceed specifications on every parking lot. Our 3 spray rigs, all with the ability to use a large spray bar for increased production, have agitated material tanks, dual diaphragm pumps for consistent pressure at the spray tip, and together can hold over 2,500 gallons of sealer. If a tanker truck is not available to deliver bulk sealer, we are set up with our own portable agitated bulk tank that has the capacity to fill the rig as soon as it’s emptied. This keeps down time to a minimum. Our newer pavers are set up with dual sonic grade sensors that automatically adjust to lay a perfect asphalt mat every time. Our entire paving operation is completed with top of the line equipment for a better-looking, longer-lasting job. Knowledge is key to growing a successful business and keeping up with the times. Andy and Russ have recognized this and frequently attend pavement seminars, classes, and training sessions to improve their overall understanding and know-how of this industry. We have also strived to become an innovative company, designing and building several tools and attachments to significantly improve our productivity.